Pappardelle is simply wide-cut, fresh pasta. You probably already know how good fresh pasta is when you purchase it at the store. When made at home, minutes before cooking, it is so much fresher ... and the taste is the best! My recipes here are usually healthy and simple to make. Today's recipe is a bit different. Healthy, yes. Simple, that's a qualified yes. The qualification being the equipment, in this case, a hand crank pasta machine. The pappardelle can be rolled by hand with a rolling pin, I know because I've done it, but be prepared to spend some serious time rolling it thin enough for pasta. The mushroom, sage, and wine sauce adds a nice flavor boost, with the fresh Parmesan cheese adding the final 1-2 flavor punch. Directions: For the pappardelle: Bring a small saucepan of water to boil. Add the spinach and parboil for about 1 minute. Drain the spinach and place into ice-cold water. When the spinach is cool, remove as much water as possible from the spinach by using your hands to squeeze out the water. Finely chop the spinach. Place the cup of flour on a large flat work surface. If you don't have flat, easy to clean counters, place a large piece of wax paper on a large wooden cutting board, then place the cup of flour on it. I used "00" flour, it's the finest flour, and is traditionally used in Italian cooking for pastas and pizza. However, any all purpose flour will work. Make a well in the middle of the flour and break the egg into the well. Add the chopped spinach to the well. Use a fork to mix the wet ingredients into the dry flour, adding flour until you have a big wet ball. Now, use your hands to knead in enough flour to make a dough that still has give, but is no longer wet. Knead the dough a few times. This should use up most, if not all, of the flour. Add a handful more flour to your work surface if you need to. Cover the dough and let it rest for 20 to 30 minutes. After the dough has rested, cut the ball into 4 parts. Roll each part into an oblong shape. Dust the dough with flour so it doesn't stick to the machine. Pass the dough through a hand cranked pasta machine, starting on the thickest setting and passing each section through twice. Reduce the thickness of the rollers, dust the dough with more flour, and pass each section through twice more. Continue reducing the thickness of the rollers, dusting the dough, and passing the dough through the pasta machine until you have reached a thickness suitable for pappardelle. This will be somewhat thicker than for normal pasta, because of the spinach. I usually take it down to a number 3 or 4 (having started at number 8). Bring a large stockpot of water to a boil. Let the dough rest while the water is coming to a boil, for 10 mkinutes or so, until it no longer feels tacky. Prepare the mushroom sauce while the dough is resting. Melt one teaspoon of the butter in a saute pan. Add the sage leaves and cook, turning as needed, until the sage leaves are crisp, about 3 to 4 minutes. Remove the sage leaves to a plate. Add the second teaspoon of butter, along with the olive oil to the saute pan. Add the garlic, onion, and mushrooms and cook an additional 3 to 4 minutes, until the mushrooms begin to brown. Add the red wine and continue cooking for 10 more minutes, until the mushrooms are soft and take on the red color of the wine. Add some chicken broth to the pan if it gets too dry, and the mushrooms and onions begin to stick. Remove the mushroom mixture from the heat. Once the dough is no longer tacky, cut it into about 1 or 2 inch widths. I also cut the dough into about 8 inch lengths. Drop the pasta into the boiling water and cook for between 5 and 8 minutes, depending on thickness of the dough. To serve, layer the noodles on each plate. Top with some of the mushroom sauce, then a few shavings of Parmesan, finishing off with several of the sage leaves. 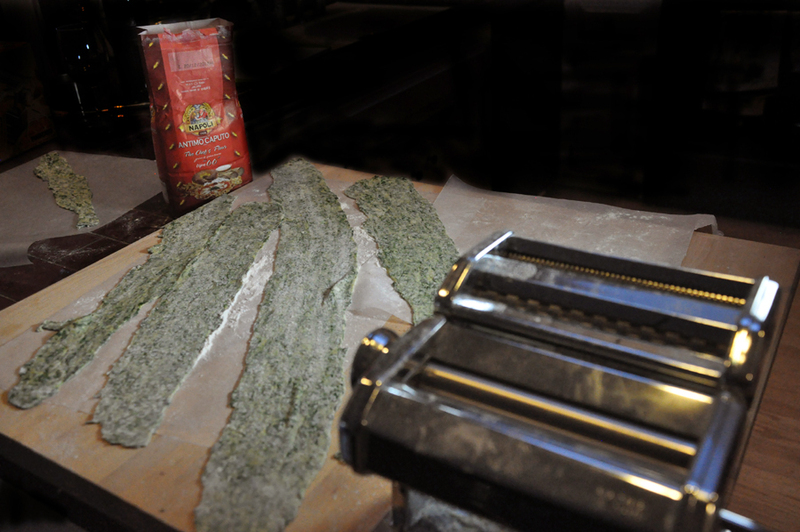 Stealthy Cooking Tip: This spinach pappardelle is a wonderful way to eat your greens. To disguise greens as part of the pasta itself is as delightfully insidious as it is delicious. 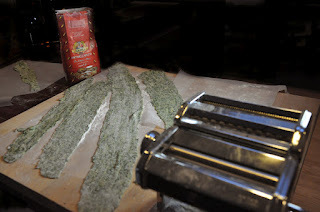 The spinach will be reduced to a fine green color if you chop the spinach fine enough. If you like to see bits of your veggies when you eat them, just chop the spinach a little larger. 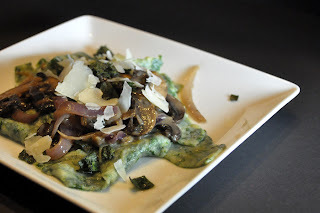 This sounds delicious and I love that you made your own fresh spinach pasta. I gotta try this. I love mushrooms. Maire, this looks delicious!